And so I begin my rogue adventure to making my very first SKIRT! I cut off the top bit of the dress and used the rest of it. I didn't really bother with measurements, as I said, I'm a rogue (or maybe lazy) crafter. 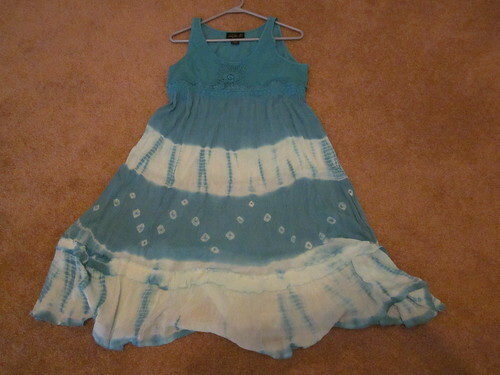 First I turned the dress inside out, then I folded the cut end in about 2", and pinned it down. Then I proceeded to make the casing for the elastic band. 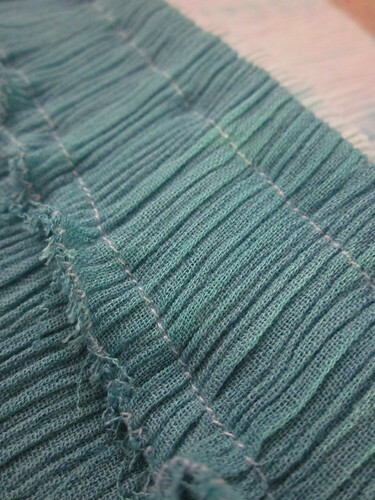 I machine sewed two lines of stitching about half an inch from either end of the casing. Because the fabric was fraying at the edges from the initial cut away from the dress, I used a zigzag stitch to keep the frays in check. I left a gap of about 2" at the lower running stitch so I can slip the elastic band into the casing. The length of the waistband to use would depend on how tight you want your skirt to be. Generally, it is about 1 to 4 inches smaller than your waistline. I took the measurement for my natural waist, because it would be further shortened when I joined the two ends together. Attach a safety pin to one end of the elastic band and slip that end into the casing. 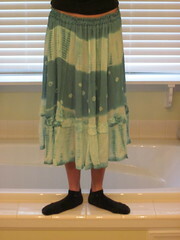 Run the elastic band all around the skirt, but hold on to the other end at all times. I searched high and low and couldn't find a safety pin in the house (!!) and had to resort to tying a knot at one end. As a result, it took me twice as long to thread the elastic band all the way through. 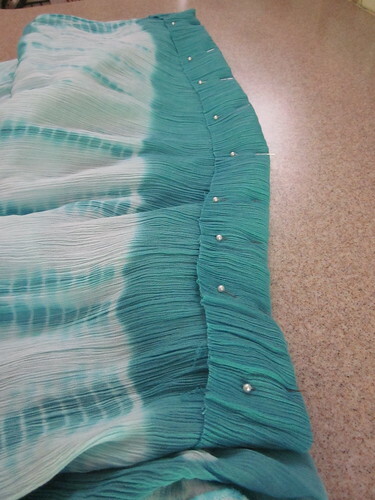 It was definitely the most painful part of the whole skirt-making process. When the elastic band is threaded through, stitch the two ends together, overlapping the ends generously. 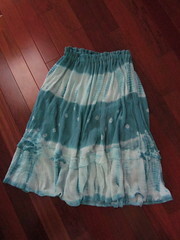 ONE NEW SKIRT in the closet! I'm loving the final length of it! P.S. what would you do with the top bit of the dress? I feel like it's such a waste to throw it away! I love the crocheted middle!